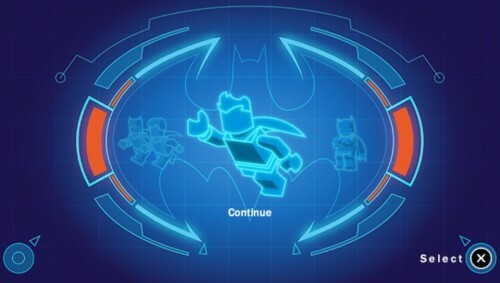 LEGO Batman 2 offers formulaic fun with beat ‘em up action, creative environment interactions and a few puzzles plus, as the DC Super Heroes subtitle states, some expanded gameplay that wisely incorporates the Justice League heroes. 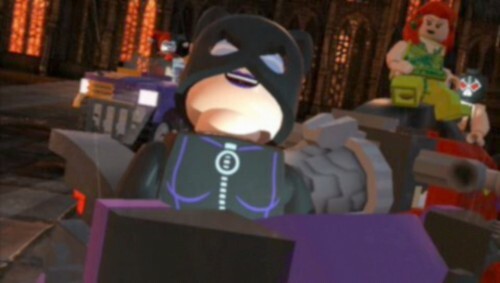 The Caped Crusader cleans Gotham City of criminal activity with his slightly inexperienced but trustworthy partner Robin in this newest LEGO game installment. 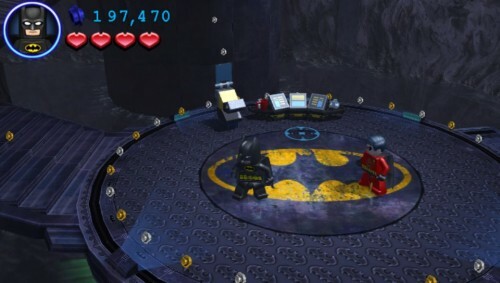 This Warner Brothers Interactive game, developed by TT Games, features recognizable characters with spoken dialogue, a first for the LEGO game series, instead of grunts, hums and coos. Handheld console game versions (Nintendo DS and 3DS also available – no PSP version) include a Justice League Alliance game mode – a battle challenge set against DC Universe villains. Set in Gotham City, the main scheme involves villains including the Joker, Bane, Riddler, Two-Face, Catwoman, Poison Ivy, Penguin, and even Lex Luthor creating destruction, terror and mayhem as Batman and Robin clean up the mess. Bystanders fear the baddies, but players never see the Caped Crusader and the Boy Wonder quivering though the latter shows his inexperience at times in comical ways. The hero characters even occasionally scoff among themselves (e.g. one scene shows Superman lecturing Batman about property destruction). 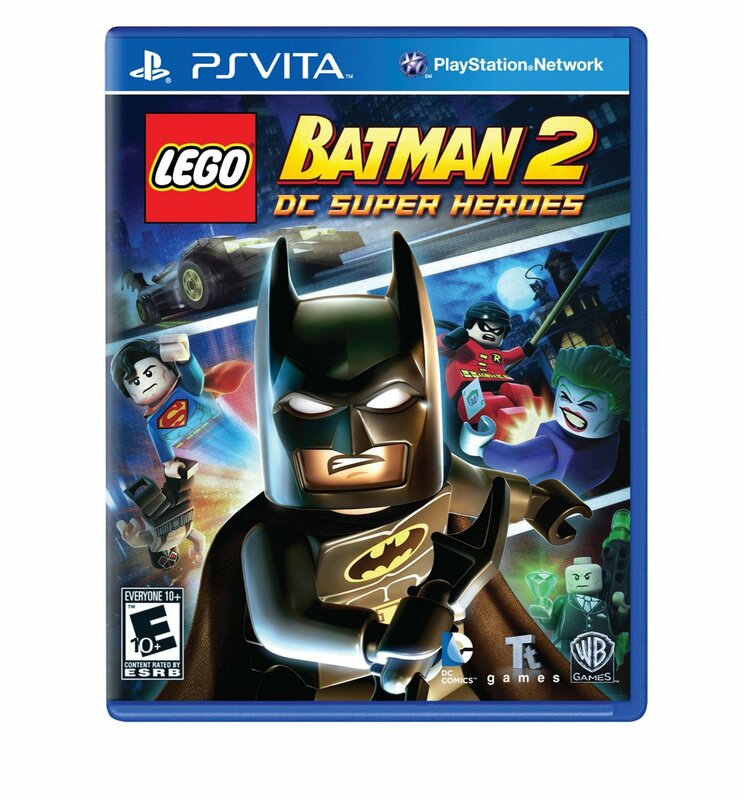 LEGO Batman 2: DC Super Heroes is easy to pick up and play and includes other DC heroes featuring their respective powers including Superman (heat vision) and The Flash (fast running speed) plus many others and some surprise characters. Each hero and villain have unique actions, which developers use towards creating the base story mode from both perspectives. Players can then replay each level in free mode once completing the story mode mission. This setup engages players in the story and parallels the increasing amount of unlockable weapons, actions, vehicles and gadgets. More intricate boss battles instead of constant barrages would improve the game. Players must keep some environmental elements for shields (unless you want to use other heroes too), which ensures lose some coin loss, but it’s worth it. Characters automatically grab ledges, which keeps younger players out of trouble and less frustrated. Players can also use choke or throw actions to dispatch adversaries quickly. The batarang comes in handy for distance attacks. When stuck in puzzles just remember everyone’s abilities and various suit properties to avoid frustrations that might make players use their PS Vita as a batarang. Using the rear touch pad option for the batarang and other targeting is incredibly sensitive. Players almost have to keep their flat hands pressed against each end to avoid any accident actions. Players can also touch the blue exclamation point(!) in the lower right corner when available and other access other presented hints. Movements can also be a challenge, especially when traversing through a tight spot. The physics are not meant to be precisely accurate and the game leaves some room for error including multiple progress options. As players switch between Batman and Robin using the triangle button, the game needs a free will off option to keep one partner stationary and not just follow the other. Also players need more save checkpoints. Players might get stuck in one area, but progress is lost unless the entire level, usually involving several enemies, is completed. Presented vehicles like motorcycles, boats, and helicopters entice in the cut scenes, but not prominently in gameplay. Players destroy Catwoman’s bike instead of using it. Special weapons have a free moving target feature using the left analog stick, which also controls movement, but a camera pan option using the additional right analog stick, one of the PlayStation Vita’s best features, is a missed opportunity though it seems developers want to keep players “on the rails” throughout the action. This somewhat linear campaign has several hidden secrets and collectible LEGO bricks. Players also accumulate (the bat cafe is a good spot) save up for extras like a 4x coin multiplier (300,000 coins). Gameplay expands with the multiplayer option that allows players to host or join other players (who must also have the game) using the two profiles/load slots. 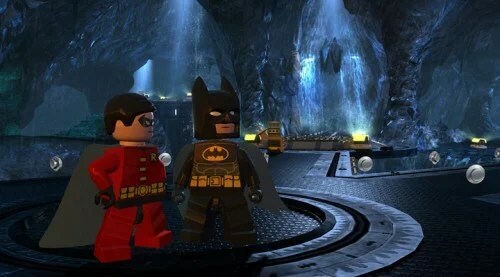 Players can create characters in the Bat cave, but, unfortunately, players cannot name their creation. The Danny Elfman music score, from the first and second Tim Burton Batman films, and John Williams’ musical score from Superman and its sequels permeate gameplay plus players can enjoy some original music, sound prompts, and some amusing sound effects. 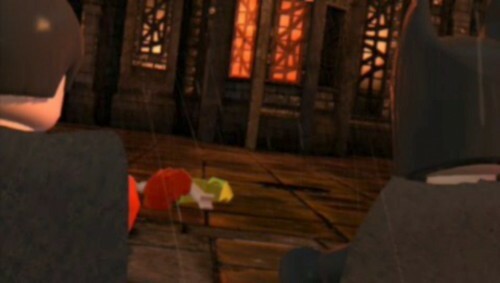 but the cutscene graphics are often blurry especially in the background. A solid, all ages game (*** out of four stars) with considerable replay value including bonus content and unlockables found in free play mode. Younger players may occasionally get stuck in their progression, but the available help, smooth controls, helpful touch options, and unlimited lives can quickly swing players through any tangles. 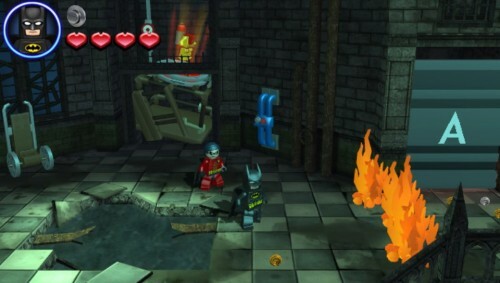 Developers add some synergy into this game experience with a tie-in of the LEGO® DC Universe Super Heroes toy collection, introduced earlier this year, which includes five construction sets including the Batcave and three buildable, detailed action figures. Look for a special ending featuring Brainiac. 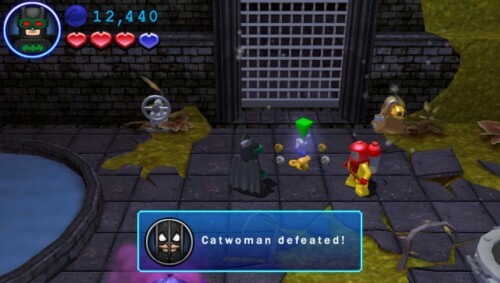 LEGO Batman 2: DC Super Heroes is also available for Xbox 360, Wii, Nintendo 3DS, Nintendo DS and PC with a Mac version. Special note: Most of the included screen shots shown above originate from my PlayStation Vita gameplay sessions and were taken by pressing the PlayStation button (left) then the start button (right). Players can still use the controls in this game while the screenshot saves, but the status screen partially blocks the main view. This entry was posted in Video Game Reviews and tagged LEGO Batman, Michael Siebenaler, Mike Siebenaler, Tall Writer, video games. Bookmark the permalink.